To better understand the past and future of California drought, some scientists are heading underground. Jessica Oster, a geochemist at Vanderbilt University in Nashville, Tenn., wants to create a high-resolution profile of the western United States’ climate, including precipitation and temperature data, throughout the Holocene to better understand the region’s history of megadroughts—droughts that last decades to centuries. “There is evidence of a period of megadroughts in the paleoclimatic record of the western U.S., but the atmospheric drivers that caused them are a puzzle,” Oster said. This evidence comes from tree rings and lake deposits, which serve as good proxy records of past climate. But data from thinly layered, slowly growing cave formations are more highly resolved in time because they grow from dripping water, Oster told Eos. When the water drips into the cave, it evaporates, leaving these minerals behind to form cones that rise from the cave’s floor or hang from the cave’s ceiling. In layers only millimeters to centimeters thick, cave formations can hold a record of climate from as long as 500,000 years in the past on seasonal or annual timescales, Oster said. Plus, different formations might record different periods with some overlapping years—giving scientists more opportunity to confirm their findings. The cave formations also provide a more complete environmental picture because rainwater not only contains the characteristic isotope makeup revealing where on the globe the water came from, but it also records information about the vegetation above the cave, from carbon isotopes it collects as it seeps down through the ground and drips into subterranean caverns. 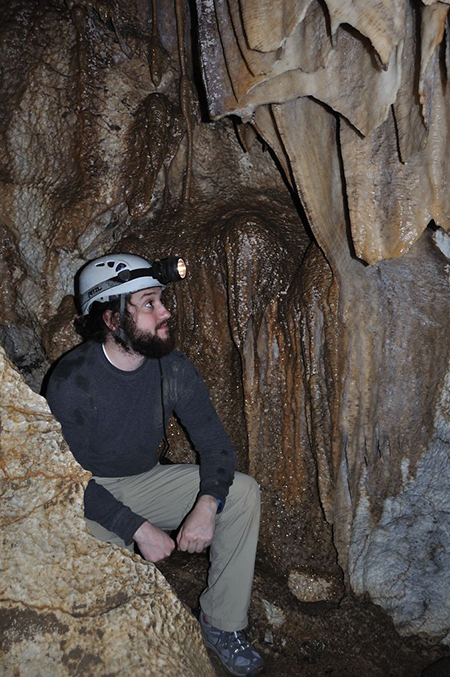 All over the world, scientists study cave formations to reconstruct ancient climates. In China last year, scientists found ancient inscriptions in Dayu Cave describing periods of extreme drought. By studying the Dayu Cave’s stalagmites and stalactites, the researchers were able to confirm that these droughts really happened. Over the next 5 years, Oster and her colleagues and students will analyze cave formation samples from California’s White Moon Cave, near Santa Cruz, and Lake Shasta Caverns in northern California. They will coax out ancient tales of cold and hot, dry and wet climates reaching back as far as 33,000 years, using ratios of elemental isotopes left behind in the mineral layers. Adding these data to already existing research on other caves in Oregon and the Sierra Nevada, Oster will have the data she needs to study the western United States. Scientists will coax out ancient tales of climates, using ratios of elemental isotopes left behind in mineral layers. Because every cave is different, the researchers also set up weather stations and collect samples of precipitation to study how each cave’s formations translate what’s happening above ground. For instance, water from storms originating in the northern Pacific versus the tropical Pacific contains different isotopic signatures. With reconstructions of the western United States’ paleoclimate, researchers can run climate model simulations that they can test against the proxy records for ancient climate patterns that they expect to glean from the caves. This comparison will help them better understand the region’s drought history, which in turn will help them understand the western United States’ drought future, Oster said. Correction, 4 October 2016: An earlier version of this article erroneously identified already existing research on other caves in Oregon and the Sierra Nevada as work that had been done by Jessica Oster. This article has been updated to correct that error. Citation: Wendel, J. (2016), Subterranean caverns hold clues to past droughts, Eos, 97, https://doi.org/10.1029/2016EO058447. Published on 31 August 2016.